Recently, the Syrian Arab Army has achieved quite a lot in fighting against ISIS in Deir Ezzor – vast territories near the city are liberated, the Euphrates crossed, a lot of terrorists and vehicles eliminated and destroyed. Meanwhile, an offensive towards Deir Ezzor is carried out by the Kurdish-led Syrian Democratic Forces aided by the International Coalition. The Kurds have captured a number of villages to the northeast of the city and are approaching the Euphrates. In fact, for this purpose the SDF de facto stalled the siege of Raqqa and moved the troops to the south. On September 15, in its article Bloomberg compared the current situation in Syria to the one at the end of WWII when the Soviet army and Allied forces were pushing to Berlin to control as many territories as possible for the post-war division of Germany. Indeed, despite the difference of the scales, Syria witnesses similar processes, despite the official statements that the US-led coalition only aims at fighting terrorism. 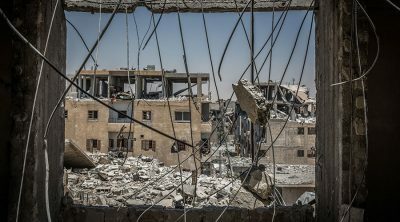 The Raqqa offensive, however, proves another thing: Washington seeks clearing as much areas as possible from ISIS before it’s done by the government troops. After the Islamic State is defeated and the war ends, the areas of influence shall become one of the main factors at the negotiations on post-war Syria. Besides, a key part belongs to the media, as the first one to clear the country of ISIS will have a possibility to increase their popularity. Thus, making use of propaganda in the U.S. media, Donald Trump may declare himself “a modern crusader” and improve his extremely low rating. The Syria war long ago transformed from an ordinary local conflict to a crisis influencing the political agenda all over the world. Europe is overcrowded with Syrian refugees, Israel fears Syria’s ally Iran and shells the SAR territory, and Turkey is up to deter the formation of an autonomous Kurdish region by the Syrian-Turkish border and is building up its presence there. All these parties are attempting to affect the Syrian conflict. But now, the main rivalry is between Syria’s legal government and Washington, which invaded the country seeking its own interests. Damascus is in the lead and the only thing the White House can do is to chase it redeploying the Kurds from one location to another. 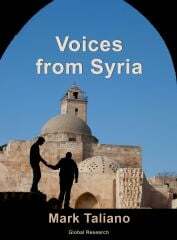 Global Research announces the forthcoming release of the print edition of Mark Taliano’s Book, “Voices from Syria” which includes one additional chapter.